Does your life ever go into a crazy period where you're not sure you're going to keep up? This happens to me, often, and I haven't worked out how to manage it yet. I work a day job that goes through crazy periods and quiet periods. I was having a quiet period, so I took on a bit of outside extra work (you know, because writing isn't enough of an extra job!). The outside job was small, manageable in a decent time period. Or at least that's what it was when I took it on. Then it became huger, later, more work, and crazy...right at the same time that work in the day job bloomed. Insanity! And in all that craziness, I'm sorry to say that my blog went out the window. Just into the 'too hard' basket. As did writing. And that's not good for my mental health. My people get all jammed up in my head if I'm not writing!!! Anyway, I'm under control for this evening and I'm doing a wildlife post. Yipeee!!! 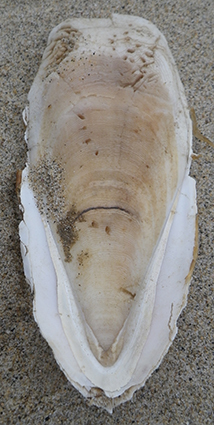 A few weeks ago I was wandering the beach when I came across a cuttlefish bone. We get them sometimes, so it's not all that exciting, except it was nibbled upon. See the teeth marks in the top? I took a close-up so you can see better. And the round holes I thought could be bird beak marks and maybe they were while the bone was washed up. But what do you reckon the more half-moon marks are from? 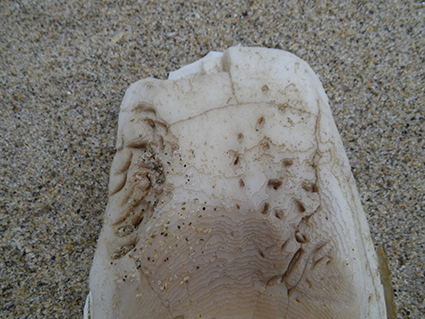 It's nothing big, because the cuttlefish bone was only 10-12 cm long, but they're deep and really show some chewing. It made me wonder if it was post-mortem or while the cuttlefish lived. Was it the cause of the death? I don;t think I've seen a cuttlefish bone chewed upon like this before, but maybe I just haven;t noticed. We used to give them to our canaries when I was a kid, which made me think bird damage initially... but it's a pretty good, "who done it? ", don't you think!